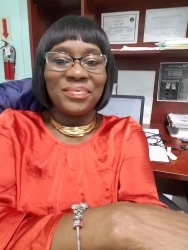 Rosedale, NY, March 08, 2019 --(PR.com)-- Nevlyn Grace Nicholson of Rosedale, New York has been recognized as a Woman of the Month for February 2019 by P.O.W.E.R. (Professional Organization of Women of Excellence Recognized) for her outstanding contributions and achievements in the field of human resources. Each month we feature women to represent their professions and industries due to their expertise and success in their chosen specialty. Nevlyn Grace Nicholson is the managing partner of STRIDE Human Resources and Organization Development Consulting. In this capacity, she works with organizations to strategically develop and utilize their resources for performance improvement and competitive advantage. Their vision from inception is to empower people, organizations and communities and provide timely cost effective solutions to those who need access to professional human resources and organizational development services. Businesses of all sizes including start-ups need relevant expertise to develop human resources policies, teams and effective leadership and they are committed to providing exceptional solutions to their clients. Ms. Nicholson has over 20 years experience and specializes in aligning organization development strategies with human resources strategies, environmental scanning, business process improvement, policy design, diversity and inclusion, talent management, curriculum development and training design. She conducts facilitation and coaching for clients in Canada, the United States and the West Indies. Previously, Ms. Nicholson served as an independent consultant providing strategic human resources and organization development solutions to small and medium sized companies. She functioned in other capacities as a Human Resources Business Partner, Human Resources Manager, and Human Resources Director. Early in her career, she was a high school teacher. Nevlyn obtained an Executive Masters in Business Administration, E.M.B.A., from the University of the West Indies in Barbados in 2000. She also holds Post-Graduate Certificates in Compensation and Benefits, Mental Health and Mental Illness and First Aid in Mental Health from universities and colleges in the West Indies and Canada. She has advanced certificates in Developing Innovative Ideas for New Business from Stanford University and Strategic Human Resources Leadership from Cornell University. Nevlyn also serves as the director of training and staff development for a large and rapidly growing nonprofit. She develops curriculum and other training materials for performance improvement and organization effectiveness. She facilitates trainings, develops measurement tools, and analyzes, interprets and report outcomes. She is a speaker, coach, mentor, lecturer and training facilitator. In her spare time, she enjoys music, travel and spending time with family and friends. With respect to her future goals, Nevlyn plans to establish a global human resources and organization development consulting company with the focus on improving business processes for greater return on investment, and developing individuals to achieve their highest potential. For further information, contact http://stridehrconsulting.com. P.O.W.E.R is a website as well as a digital and print magazine featuring celebrities and everyday hardworking professional women. Our mission is to provide a powerful network of empowering women who will mentor and inspire each other to be the best they can be. Through our valuable services, our members can network, collaborate with like-minded professionals, gain recognition and obtain knowledge from those who have already achieved success.